Writers participating in National Novel Writing Month are at the half-way point. If a writer is on track, then he or she is 25,000 words into the 50,000 word manuscript that will be complete by the end of the month. I thought for a second about joining NaNoWriMo, but then the moment passed. The process would likely send me over the edge. I applaud anyone who can do it, and maybe someday I’ll be able to, but not now. In fact, during the last month, I went the other way. Instead of belting out as many words as possible in a short amount of time, I took a break. I haven’t written a blog post or a single sentence for a work in progress. In fact, I don’t have a work in progress. The “write everyday or die trying” writing gurus are probably tsk-tsk-ing at me, but I’m okay with that. I needed a break. The truth is, writing daily doesn’t work for me. 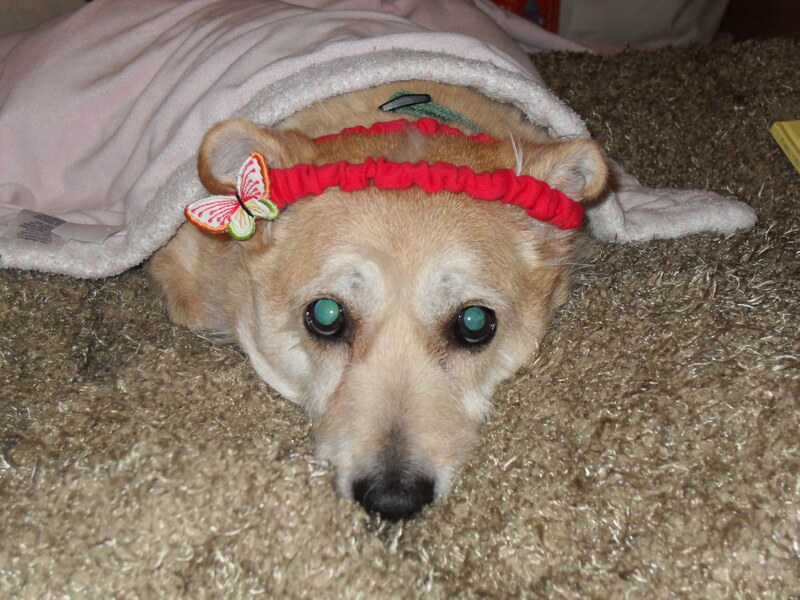 Here’s why: I am a single mom of an active 5-year-old girl and a not-so-active but needy 14-year-old dog. Here’s a picture of Rusty putting up with my daughter. Isn’t he a good sport? I start teaching at 7:30 a.m. and often have after-school commitments that are followed by getting the humans and canine fed and ready for the next day. If I have a snow day, if my daughter and dog go to bed early, or if my parents invite my daughter for a sleepover, I write. And I mean, I go for it. When I have a block of writing time, I often don’t leave the computer unless it’s for food or a bathroom break. I work every minute of the time I get to write, but these moments don’t happen every day. I write when I have time, but I don’t have the time or mental energy to write every day. This is why I would be a NaNoWriMo casualty. I can’t commit to a certain word count each day with the goal being a completed novel by the end of the month. Just the thought of it makes me shiver. Maybe one day, but for now, my “write when I can” method works. I’ve written two pre-published young adult novels. Soon after completing the second one, I tackled a major revision of the first one. After that, I needed a break. I’m glad I did it, too, because I want to love what I’m writing. I want the characters to dance in my head while I’m in the shower or driving to work, acting out the scenes that will become chapters when I have the time. If I had thrown myself into NaNoWriMo with a half-baked idea, I would have cried, “Mercy” by now. Stepping away from the keyboard has been good for me. I’m ready to start developing a new idea. I’m excited about that. It won’t get done in a month, but that’s fine by me. WWIC … I’m with you! Thanks for posting on FB … glad to be following you. I’ve always loved your style, candor and ease. And that banner is awesome! Very eye catching and appealing.